Washington (CNN) - Those hoping for any clarity on whether Hillary Clinton will run again for president in 2016 will have to keep their fingers crossed a little bit longer. She's still deciding on when to decide. In an interview with ABC News' Diane Sawyer, the former Secretary of State hedged on any timeline for when she would publicly reveal if she will run for the Oval Office, saying she probably will not make an announcement before the end of the year. "I'm doing to decide when it feels right for me to decide," Clinton told Sawyer. Questioned by Sawyer on just when she will make that decision, the presumed frontrunner - if she runs for the Democratic nomination - described her process in the muddiest possible terms. "I will be on my way to making a decision by the end of the year," Clinton said. "But probably not announced until next year?" Sawyer pressed. "I'm not positive about that," Clinton replied. "But I think you know the way I make decisions is that's probably likely." Not surprising, Clinton holds a commanding lead over all would-be rivals in the 2016 Democratic primary field. A new ABC News/Washington Post poll released on Sunday of registered Democrats and Democratic-leaning independents shows her outpacing the pack, with 69 percent favoring Clinton for the party's nomination over seven other hypothetical contenders. Vice President Joe Biden lags in second, getting 12 percent support, while progressive darling Elizabeth Warren garnered 7 percent in the poll. The veritable chasm between Clinton and other potential candidates would seem to freeze the field in place. But, while Clinton may be the only game in town right now, Democratic voters want to avoid a prolonged coronation. In that same ABC News survey, 58 percent said they want other non-Clinton options to choose from in voting for a nominee. 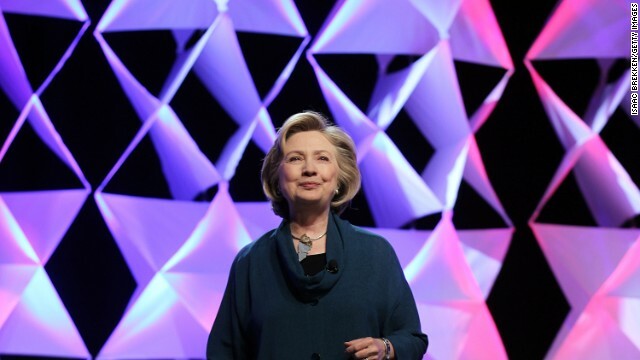 Clinton herself said that other people contemplating presidential bids should not wait on her to make up their minds. "People can do whatever they choose to do on whatever timetable they decide," she said. Yes, on Hillary16. Very shrewd lady. She is already running, and we all KNOW it. The suspense is killing me , you know she is going to run when Bill C personally starts driving the super size GO GIRL pink campain bus. Hope she means she'll decide when her brain feels right, which will never happen. Let the INCOMPETENT GOP SQURIM until the last minute, they have NOBODY that CAN beat you Hillary and deserve NOTHING just as they have been trying to SABOTAGE obamas an your every move , most of the country can't wait to kick the GOP OUT of office. If she is smart she will cash in on everything she can then not run at all. Let the Republicans beat themselves up and trash their chances- the Democrats don't need to announce for a year. She just needs to wait for the next couple ObamaBotches and then she can totally stab Obama in the back at will. However if Obama strikes back with an IRS audit for Hillary's term as SOS, she might be in trouble. Trying to explain the $ billions lost during her term. She's already decided and knows that by not announcing it keeps any other Democrat from being able to raise serious money. Elizabeth Warren for president, and Julián Castro for VP! They would be unbeatable. Even a Clinton/Castro ticket would be unbeatable. Go, Dems! Clinton has been running since she resigned as Secretary of State. Her resignation and every move since is about enhancing her image as Candidate Clinton. Please no. We are SO TIRED OF HER ALREADY! Set aside her massively poor performance (and deadly) as Sec of State, she is just not right for America. She also lies. Fidel and Raul Castro are more in line with the Democrat Party these days. Hillary Clinton will decide NOT to run after the November elections when the Republicans control the House AND Senate. The country can't afford another 4-8 years of a Democrat in the Oval Office, disregarding laws, destroying our healthcare system, lying to us, wrecking our world standing as well as the economy. Hillary "What difference does it make now" is a female Obama – we can't stand another term like his – disregarding the Constitution and breaking our laws! Where are the "fresh" candidates? I am so sick of the media pushing their candidate(s) on us! How about someone other than a Clinton or Bush – how about that? How about a Constitution/Bill of Rights follower? Wouldn't that be refreshing? Hillary Clinton should be donating ALL OF THE PROCEEDS of this book to the families of the killed and wounded in Benghazi. It is the LEAST she could do for her major failure to protect and help them in their hour(s) of need. Hilly dont even know if she wants to run shes to old to run she will have to walk or crawl if she does i can see it now . HILLARY, go away and take your pervert with you. If she runs, the republican party in bound to implode. It should be a good show as they cannibalize themselves in public. Stay tuned. I hope she runs. It will be a fun time watching her squeal and squirm on her record. She would be doing the opposition a big favor if she did. She just has to much baggage to defend and no major upticks as Sec. of State where our world stand went into the toilet. That's perfect red meat for the Hillary Haters. She's deciding about when to announce when she's deciding. One of the problems the Republicans will have, is that since the media will be her lapdog, just as they are for all democrats, any criticism her opponent makes, they'll say "you're a sexist" or "you're only saying that because she's a woman." They will play that card to the very end. Mark my words.